Casual elegance has a new look. This coffee series appeals to even the most discerning palettes with its versatility, high practicality, and truly unique style. Split dual shelves offer plenty of functional display and storage space, while the tabletop is the perfect size for those evenings in. The surfaces' wooden-look bring a natural feel that contrasts stunningly with the sturdy metal legs, base and studded detail. 90 day warranty on any manufacturer defects and a 1 year warranty on any service/replacement parts. Call 1-905-362-5555 for complete warranty details. 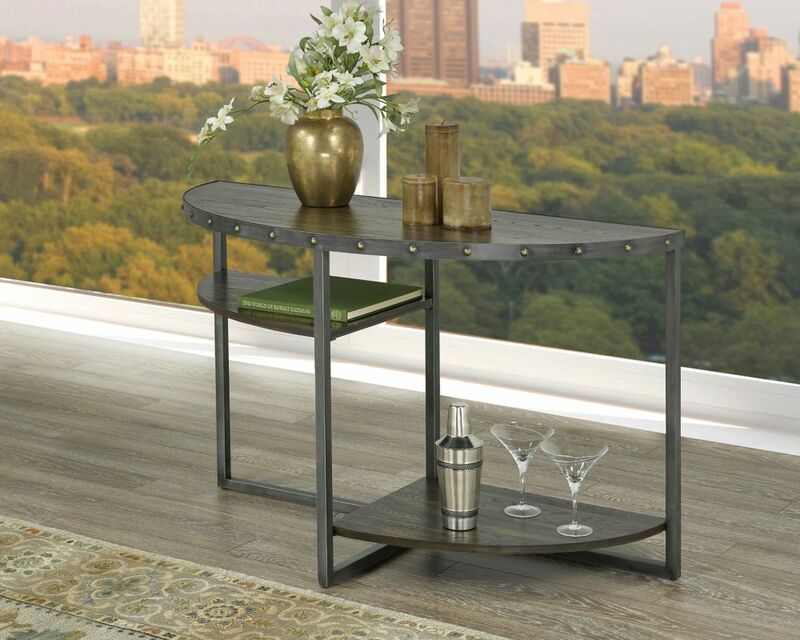 Oxford Sofa Table, Dark Walnut Casual elegance has a new look. This coffee series appeals to even the most discerning palettes with its versatility, high practicality, and truly unique style. Split dual shelves offer plenty of functional display and storage space, while the tabletop is the perfect size for those evenings in. The surfaces' wooden-look bring a natural feel that contrasts stunningly with the sturdy metal legs, base and studded detail.